When is it safe to go at busy roundabouts? If you're missing safe opportunities and unsure when to go at busy roundabouts then hopefully the tips and video below will help. Hesitating at roundabouts is quite common when you're learning to drive as you need to work out quickly when to go and it's especially difficult as a lot of other drivers don't signal when they should or they signal incorrectly. To help, we're going to have a look at how to anticipate other vehicles, not by relying on other drivers to signal properly but by looking out for other more subtle clues. With practice and experience, you'll soon be making the correct decision to either stop as it's unsafe or go as there's an opportunity. Every roundabout and situation is different. It's highly recommended that you get lot's of practice with a qualified driving instructor and only take opportunities to go that are safe and don't affect anyone else. Practice on quiet roundabouts first and build up to the busy ones. How we approach and prepare for the roundabout is really important. We first need to identify that there's a roundabout ahead. 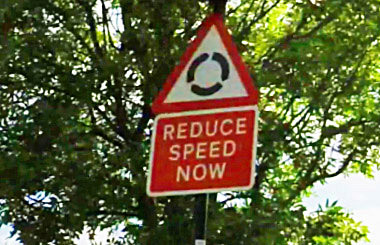 Plan ahead for any signs and after you'll see the roundabout. Slowing down early really helps as it gives you more time to work out if you can go straight away or need to stop. You have to give priority to traffic approaching from your right unless signs, road markings or traffic lights direct you otherwise. 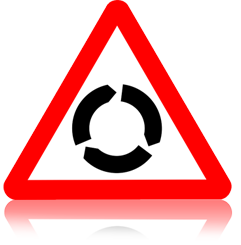 Be careful as you approach the roundabout to not only look right and decide to join as another vehicle in front might stop suddenly at any time and you don't want to hit the back of them. Look right on approach as well as ahead. 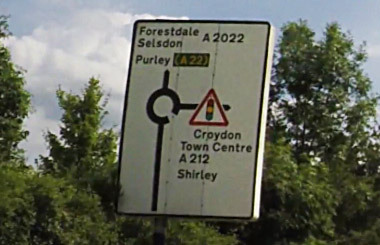 If you feel that roundabouts are a little overwhelming and there's too much to do, then try approaching them a bit slower to give yourself time. As you approach the roundabout, check your mirrors to see whos near you and what they intend to do. Signal if needed. Make sure that you're in the correct lane. Brake gently. Check the roundabout early to see how busy it is. If you observe too late then you won't be ready for opportunities to move onto the roundabout. Look to go but always be prepared to stop. Keep checking not only to the right but also ahead. Don't assume that the vehicle in front is going to go when you think they are as they could stop for any reason. Looking for opportunities at busy roundabouts. We have to give-way to the right. 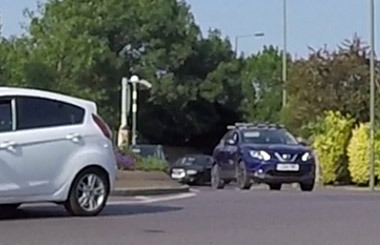 If another vehicle coming around the roundabout is moving off to exit (towards where you're coming from) then they will block the vehicles to your right and can give you an opportunity to enter if you time it correctly. But how do we know if the other vehicle on the roundabout is going to exit and block the other joining traffic? As a lot of other drivers don't signal or signal incorrectly, try looking at the other vehicles position, speed and where the front wheels are pointing instead to determine where they're going. Look at the difference between the two cars on the right. The top one shows a white vehicle coming around the roundabout that we have to give-way to. The dark blue car in the picture below it shows one leaving and blocking the vehicles to the right. If the vehicles on the right are being blocked then and this would normally be a good opportunity to go. You have to time it correctly and be confident to move off quickly without stalling. 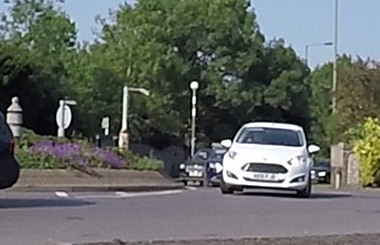 Look how the white car is leaning over and keeping closer to the roundabout. 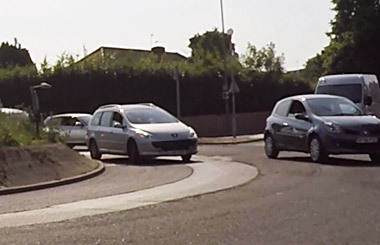 The dark blue car is moving away from the roundabout, the front wheels and vehicle are pointing straight. Never assume the other vehicle is coming off to give you an opportunity. Check, check and check again to make sure it's safe as you don't want to affect another road user. Causing another road user to slow down, stop or swerve is dangerous and will lead to a driving test fail. If you're unsure it's safe then don't go. Get plenty of practice with a qualified driving instructor. Only go when it's safe. Another vehicle leaving the roundabout towards where you're coming from doesn't always give you an opportunity. Every roundabout and situation is different and sometimes when a vehicle is leaving the roundabout, another vehicle on the inside lane might be going around that you'd have to stop for.